Strawberries are my absolute favorite fruit to use in a dessert. It is the perfect sidekick to anything chocolate (chocolate covered strawberries, anyone? I need to visit my fridge, give me a minute). I just cannot get over my obsession with the chocolate-strawberry combination; I’ve been experimenting with it quite a bit. Being home alone most of the time gives me a lot of room to go a little crazy in the kitchen; I took the liberty and decided to do something out of my comfort zone. And Lo and Behold! 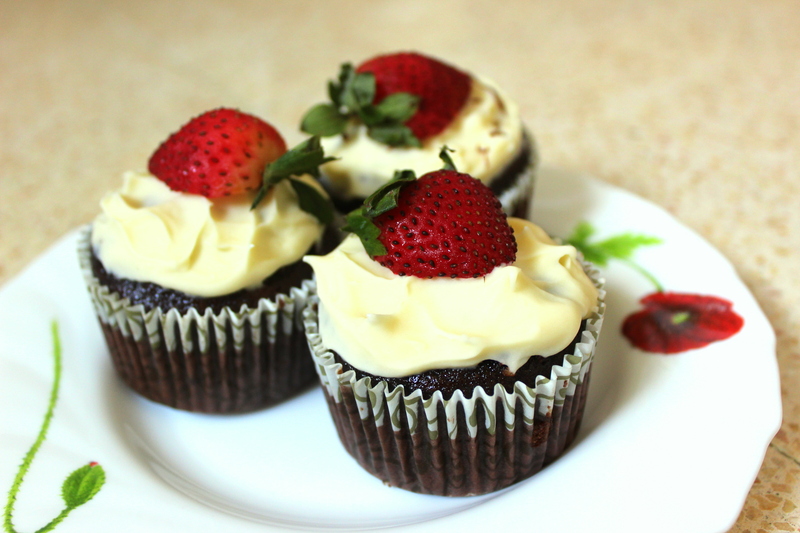 I came up with these moist gooey chocolate cupcakes filled with fresh strawberry chunks, topped with vanilla butter-cream frosting and finished off with fresh strawberries. It sounds really exotic, but it’s really not so hard to put together, and let me tell you – it tastes FABULOUS! 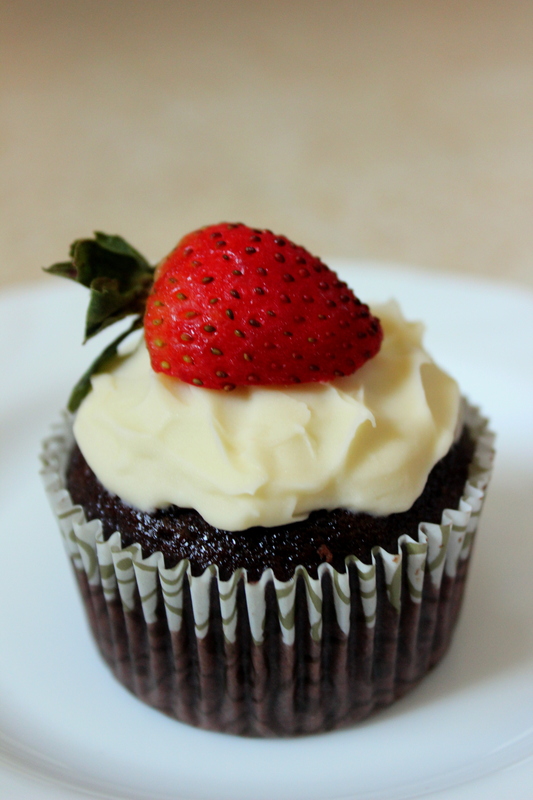 You can use your favorite go-to chocolate cupcakes recipe, it will work just as well with the strawberries. This is the recipe I normally use, and I absolutely love it. 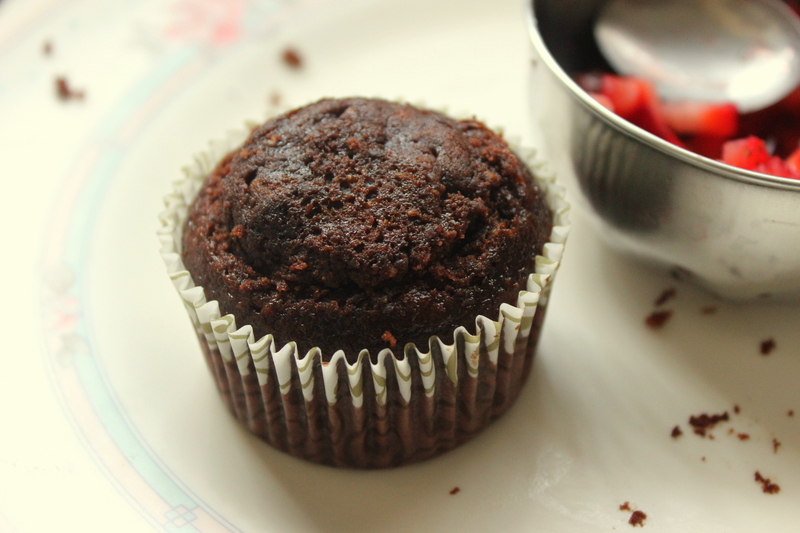 I never go wrong with this recipe, the cupcakes always come out perfectly risen, moist and not-too-sweet, just the way I like it. Bake for about 12 minutes or until wooden pick inserted comes out clean. Keep them on a wire rack until cooled completely. 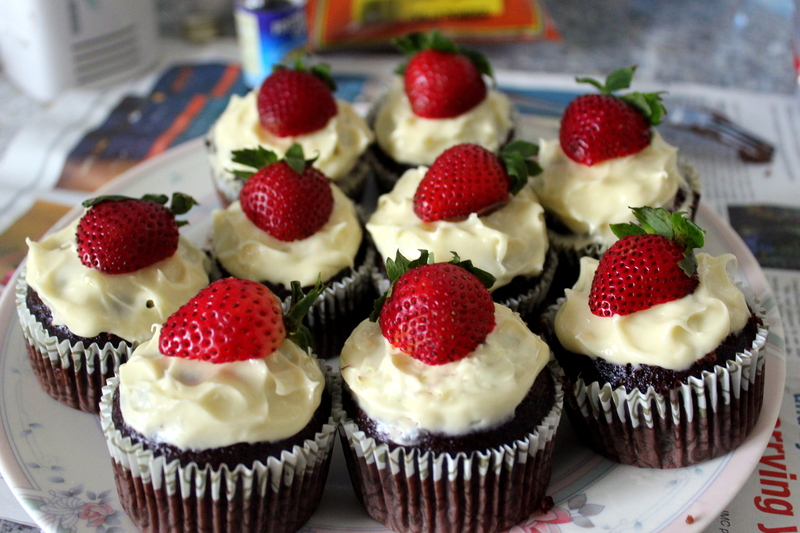 Now, try not to eat all of them up before you fill them in with strawberries and finish them up with the frosting. So next up – filling the cupcakes! 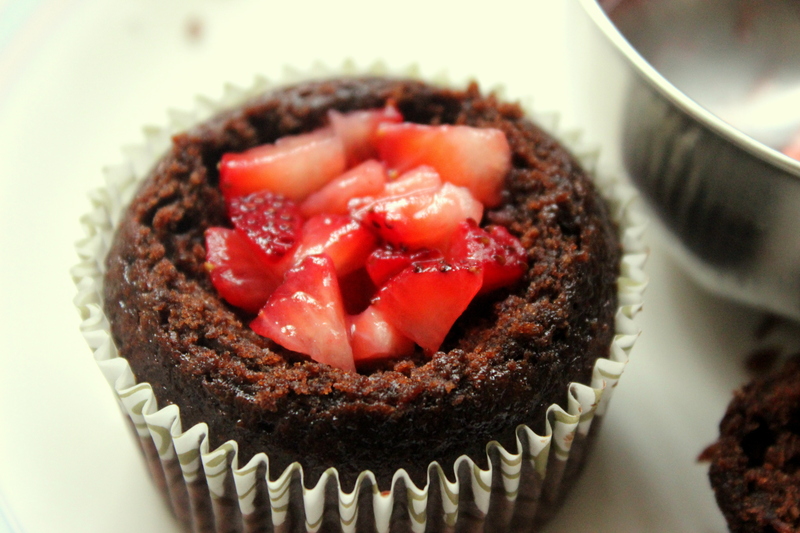 Cut up a few strawberries into really tiny cubes and toss them with some granulated sugar. Then scoop out the top of your cupcakes in a cone. I know, it sounds very hard to do, but its not. Hold the cupcake in your hand, take a serrated knife and insert it into the cupcake and cut at an angle while you turn the cupcake in a circular motion. That way, a cone shaped piece of cake with come out. Now, of the cone you have, cut off the lower cone portion till you only get the top disc of cake. 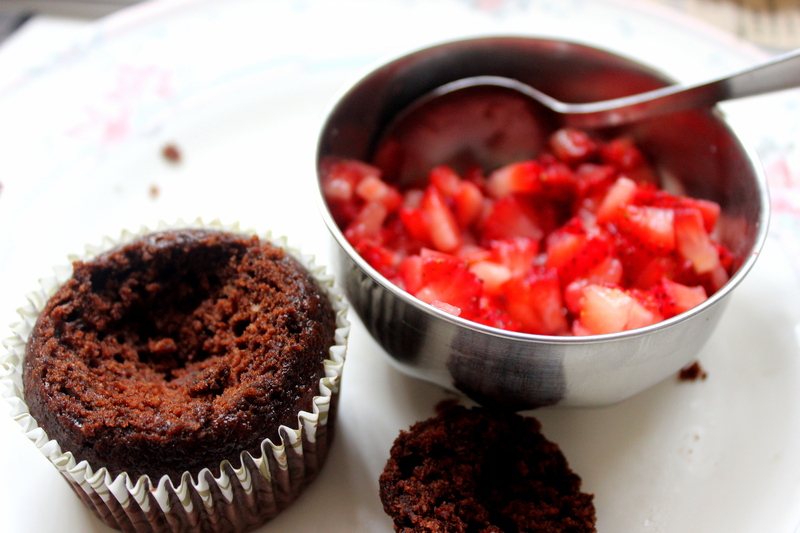 Then fill the hollow with some of the prepared strawberry filling and then recover the cupcake with the top disc of cake. Now that you’ve successfully filled the cupcake, frost on some vanilla buttercream icing and top it off with a fresh strawberry. Blend all the ingredients till you get a smooth creamy delicious frosting. And here’s how you eat them. 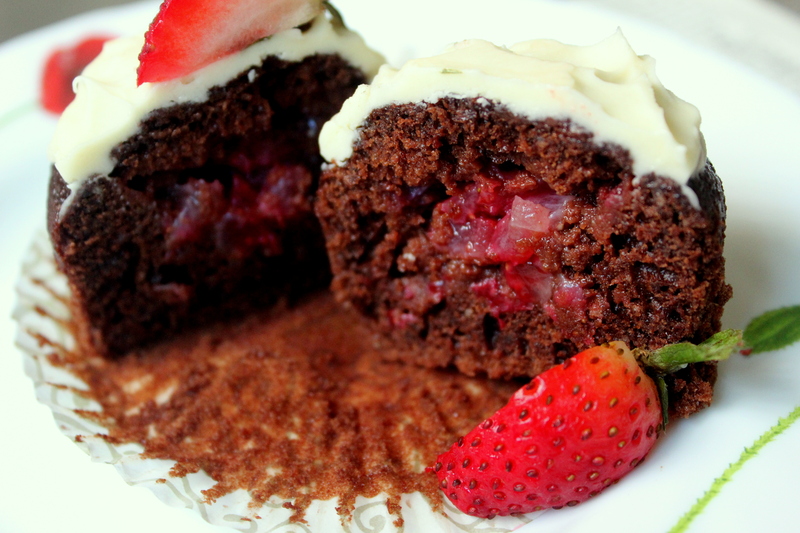 Tear the wrapper apart, and take a big bite of the cupcake; all at once there will be the gooey chocolate laced with the sweet and sour strawberry center, the sweet creamy texture of the vanilla buttercream and the freshness of the strawberry-on-top dancing a tango on your tongue. Indulge and revel! A little tip: These cupcakes taste different as they age. 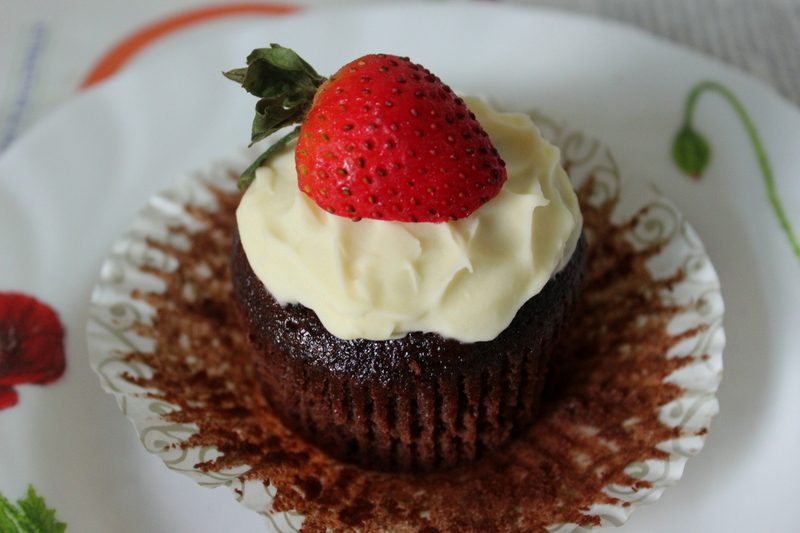 On the first day they had bang-on distinct flavors, while after keeping them overnight the strawberry filling made the cupcake taste a little like a black-forest cupcake as it gave out the flavor of kirsch or strawberry liqueur that is used while making a black-forest cake. So according to me, they taste best right away, but if you’re a black-forest fan then you’re going to love it the day after too.